The NFL’s free agency period is often times the most exciting period of the offseason for fans, and this year’s class of free agents may just be the best we’ve seen in years. Coinciding with our 2018 Free Agent Tracker, and the release of our 2018 Free Agency Guide, which includes PFF profiles, stats and analysis for hundreds of potential free agents, we thought it best to preview the top of the class of impending free agents, in a way only we at PFF can — key advanced statistics on each and every one of them. While some of these players may be likely to re-sign with their respective teams from 2017, others may not. Without further adieu, here are the top 15 impending free agents who’s contracts were up, in one way or another, with their respective franchise after the 2017 season. The 49ers likely found the franchise’s savior when they traded for Garoppolo last October, and after watching perform so well in his time as the starter, it makes little sense to let him walk straight back out of the door. Reports that the ‘Niners are trying to secure Jimmy G to a long-term deal are already circling, and if they do manage to lock him up, the 49ers will be delighted to retain a quarterback that showed tremendous poise while under pressure this year. 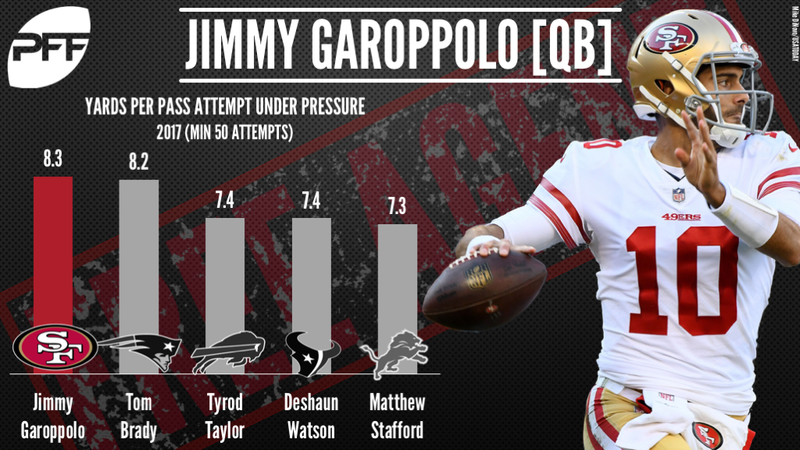 Since taking over as quarterback in Week 13, Garoppolo produced an adjusted completion percentage of 71.4 percent on his throws under pressure, which ranked second among 39 quarterbacks with at least 40 attempts, but that mark is made all the more impressive by the fact that he averaged a whopping 8.3 yards per attempt on those throws, the best mark of the season and the 11th-highest mark ever recorded by PFF. After playing two straight seasons under the franchise tag in Washington, the veteran quarterback will once again enter the offseason with his sights set on a long-term contract. As the saga rolls on, the eventual winner of the Cousins sweepstakes will get one of the coolest performers in the NFL when it comes to throwing from a clean pocket. 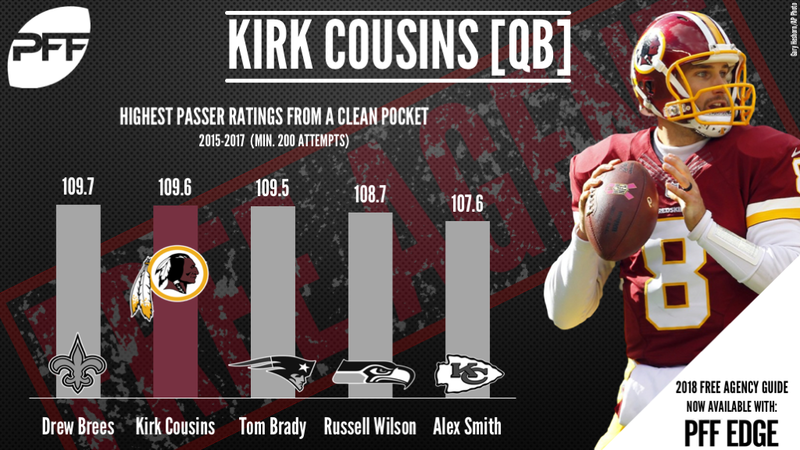 Since taking over for Robert Griffin III to start the 2015 season, Cousins has logged a passer rating of 109.6 on throws without pressure, which is second only to Drew Brees in that span and beats out notable signal-callers such as Aaron Rodgers, Matt Ryan and PFF’s 2017 offensive player of the year, Tom Brady. At the halfway point of the season, it seemed highly improbable that the Steelers would part ways with the versatile playmaker, but as we further we approach the offseason, it seems more and more apparent that Bell and the Steelers are heading for divorce. Bell, who has been one of the most consistent players in the game over recent years, has achieved PFF overall grades of 91.2, 93.9, 91.9 and 85.4 over the last four seasons, which was good for second, first, first and seventh among running backs, respectively. Since 2015, Bell has logged 2,030 offensive snaps, more than any other running back in the league, and he’s averaged 2.89 yards after contact per rushing attempt, the third-best mark among backs with at least 1,000 attempts in that span. He also averaged 1.36 yards per route run which is the 21st-best mark among running backs with at least 100 targets and all told, he’s combined to force a total of 150 missed tackles, which is the league’s second-best total. PFF’s breakout player of the year picked the perfect time to unleash the best season of his young career and will look to cash in on a big payday after he spent most of the 2017 campaign terrorizing opposing quarterbacks. All told, Lawrence put up 79 total pressures from 425 pass-rush snaps this year, giving him a pass-rush productivity of 14.8, which was the best mark among all edge-rushers in the league with at least 130 pass-rush snaps. On average, he produced pressure once every 5.4 pass rushes, the league’s second-best rate behind only Elvis Dumervil. After the Patriots opted to sign cornerback Stephon Gilmore to a five-year $65 million contract last offseason, the chances are that the hero of Super Bowl 49 will be allowed to test the open market. Whoever secures Butler’s signature this offseason will get one of the best playmakers available at the position, as Butler has got his hands on 35 (29 pass breakups and six interceptions) of the 285 passes that have been thrown into his coverage since 2015, giving him a playmaker index of 15.4 percent, the fourth-best mark among cornerbacks with at least 200 targets in that span. Prior to the 2017 season, the Panthers signed both right guard Trai Turner and left tackle Matt Kalil to big contracts and because of this, the Panthers will have limited cap space to work with impending free agent Norwell. He will very likely have a lot of interest if he hits free agency as the fourth-year guard put together an impressive season that saw him ranked third among guards with a PFF overall grade 88.8 and a first-team All-Pro selection. While Norwell performed well in the run game (83.4 run-block grade – eighth-best among guards), his performance in pass protection is what will set him apart from other players at the position. 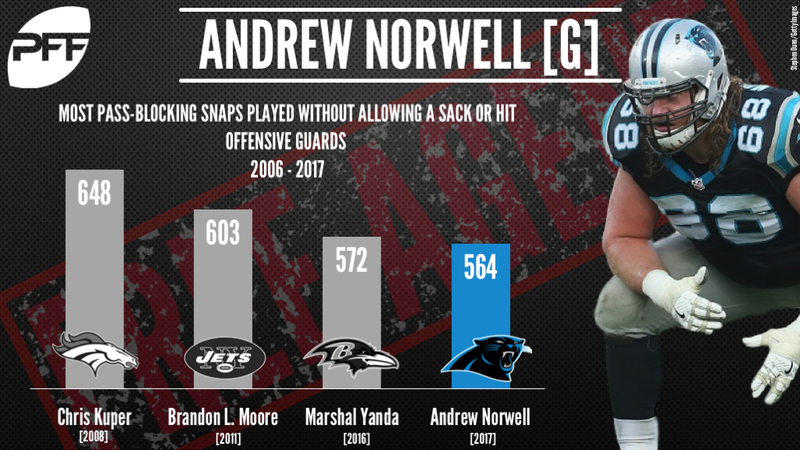 Throughout the regular season, Norwell allowed just 13 hurries on his 564 pass-blocking snaps, which resulted in a pass-blocking efficiency of 98.3, the second-best best mark among qualifying guards. He was also the only offensive lineman in the NFL to log at least 500 pass-blocking snaps without allowing either a sack or a quarterback hit, which makes him one of only four guards who have achieved this feat since PFF started collecting data back in 2006. Since he entered the league in 2014, Antonio Brown (472) and Julio Jones (411) are the only two wide receivers who have logged more receptions than Landry’s 400, which justifies his desire to be paid like a true No. 1 WR. As free agency looms near, the Dolphins need to make a decision on the fourth-year pass-catcher, who has excelled as a slot specialist since entering the league, racking up a total of 267 receptions and 2,880 receiving yards from the slot, both of which rank first among receivers in that span. His average of 1.94 yards per route run from the slot ranks third among receivers with at least 50 slot targets as well. However, whoever wins the race for Landry’s signature will not just be getting a top-tier slot receiver, they’ll also be getting a mightily productive red zone weapon. 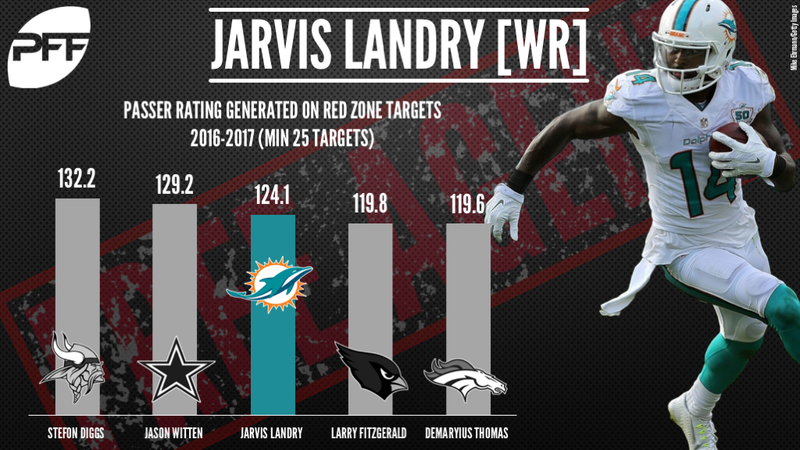 Landry has generated a passer rating of 124.1 on his red zone targets over the last two seasons, the second-best mark among wideouts with at least 25 red zone targets since 2016. In 2015, Ansah enjoyed a breakout season and flashed the traits of a perennial Pro-Bowler after he ended the season with 13 sacks, 19 quarterback hits and 33 hurries on his 397 pass-rushing snaps. While injuries have played a major part in hindering his progression since, the fifth-year edge-rusher looked to be back to his best form down the stretch of the 2017 season. In the last six games of the season, Ansah tallied a whopping eight sacks, four hits and seven hurries on his 129 pass-rushing snaps, which resulted in a pass-rushing productivity of 12.6, the seventh-best mark among 4-3 defensive ends in that span. 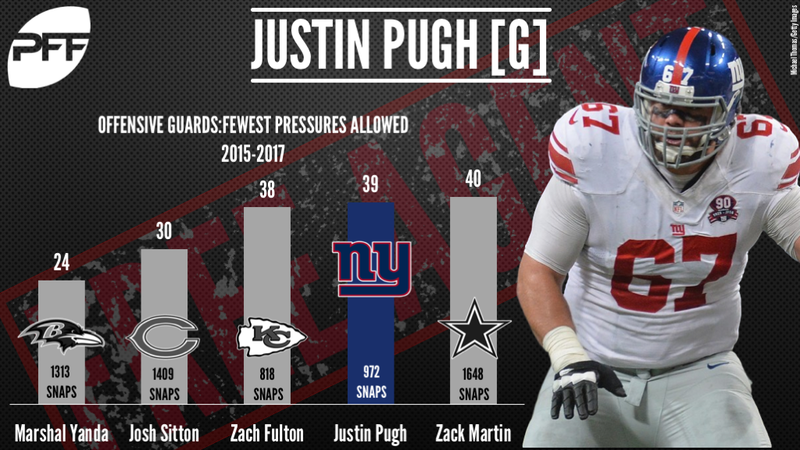 Since entering the NFL as a first-round pick in 2013, Pugh has emerged as one of the better guards in the NFL, but unfortunately, injuries have plagued him in all but one of his professional seasons. With an entire offseason to recover from the back injury that cost him the last six games of the 2017 campaign, Pugh enters free agency as a high-end, starting caliber guard, who graded above 80.0 in both 2015 and 2016, and has allowed just 39 pressures over the last three seasons on the interior, the fourth-best mark among guards with at least 750 pass-blocking snaps since 2015. The veteran tight end has now come to the end of the four-year deal that he signed with the New Orleans Saints, a deal that he signed just a year prior to being traded away to the Seahawks in an experiment that will ultimately go down as a disappointment. Prior to the trade, Graham was regarded as one of the best tight ends in the league and finished in the top-five in yards per route run among tight ends every season from 2010 to 2013, including two first-place finishes. However, his production has failed to reach such heights since, even ending the 2017 season averaging just 1.11 yards per route run, the 32nd-best mark among tight ends and the lowest of his career. 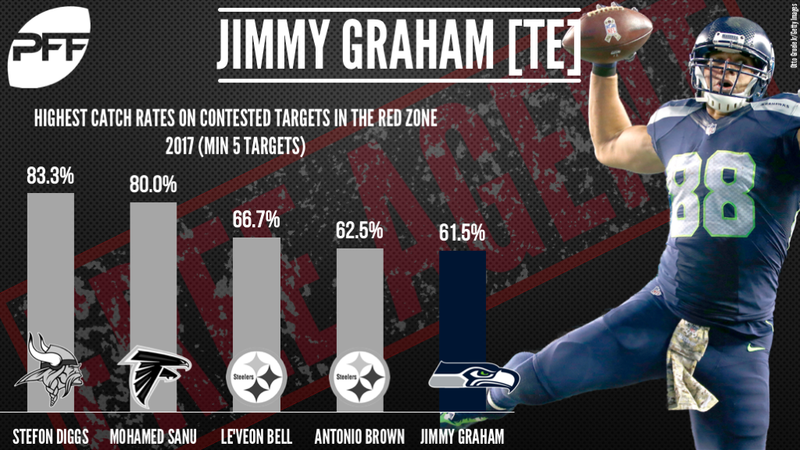 As Graham seeks to reignite his career, teams will undoubtedly be intrigued by his performance in the red zone this year. At the close of the regular season, no player in the game saw as many red zone targets (27) or contested red zone targets (13) than Graham, and he thrived in those contested situations, producing a catch rate of 61.5 percent and generating a passer rating of 107.4, both of which ranked first among all tight ends.